Ah the Galway races, a highly anticipated event in the racing calendar for punters and fashionistas alike. All our outfits planned, some- months in advance and others put together the day before and all with the intention of looking our best on race day and seeking out the eye of the judges. I decided to focus primarily on pregnancy style for the races. For many years now I have been providing a one on one consultation service to mum’s to be but this was now personal being pregnant with my first child. I won’t lie, while I am thrilled and excited to be expecting I have been having feelings of inadequacy in the style stakes purely from a weight perspective and having to compromise a little on my style choices. All of these are little things, the sacrifice of which is for the greater good but still left me a little self-conscious especially as I work in the fashion industry. 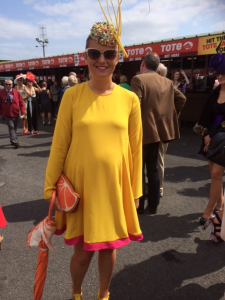 For the Galway races I wanted to know could pregnant ladies still put it up to our non- pregnant counterparts. Would we be happy with what we had selected to wear, and was it easy to find? Special mention to House of Fraser for kitting me out for the day in brands unique to their store including an ultra-comfy Pied-a-Terre dress retailing for €89.00, Hat was from Untold on sale for €90.00, a fabulous biba leopard print bag retailing at €160.00 and a mango belt for €40.00. I can honestly say I felt a million dollars along with being super comfortable. 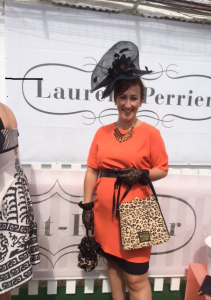 The great thing about dressing up for race days is that it is all about how you put your outfit together, accessories shoes, hats and bags. Hurrah for items that do not discriminate no matter our shape and size! All of the ladies I met looked fabulous and more importantly were honest and forthright in their assessment of their own style. Agreed compromises had to be made but each proud of their bump and unwilling to just stand on the fashion side-lines for race-day despite restrictions of pregnancy. What stood out was all the women I interviewed were not wearing pregnancy specific clothing and were happy to choose something off the rail but in a different size. First I met Maria Byrne from Carlow a finalist last year who was a perfect example of what I was looking for. 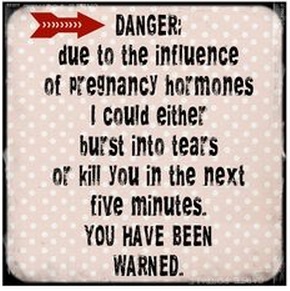 How did she feel now that she was pregnant? Did she like what she was wearing? Maria stated that comfort being an important factor the emphasis was still wearing something that was fitted and stylish and with little compromise to her overall style. 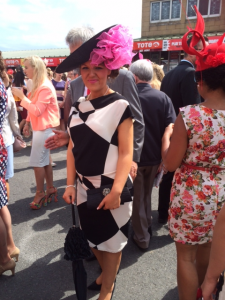 You’ll agree that she looked fantastic in a classic monochrome dress from Fran and Jane contrasted with a splash of fuchsia in her hat – AND she was wearing heels my hero!! 2nd on the list was Yvonne O Connell originally from Cork now living in Dubai was home for the summer and was also an avid race goer. She too was expecting her first child with some complications but looked effortlessly chic. Her outfit was purchased in Dubai including an oasis hat, and Jessica Simpson shoes. She looked stunning with a very simple fitted dress in a charcoal colour with really complimented her skin tone, which is a great way of standing out. One thing I noticed was that she was wearing a good heel also but this was nothing like what Yvonne was used to and felt she had to compromise significantly on style to be able to dress for her new shape. 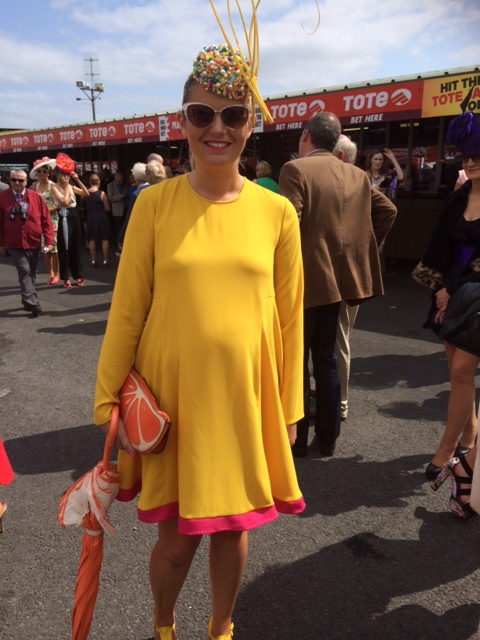 Last but not least and my overall winner for pregnancy style was Emily O Regan an Australian living in Galway. Emily is a milliner and has her hand in a lot of fashion arenas in Galway. What I liked about Emily was her use of colour and sheer confidence in her new shape and willingness to style her bump. She showed great creativity with her handmade hat picking up her Zara dress (one which she edited by adding a hem of a pop of colour to really bring the outfit together) and with her selection of yellow (not for the faint hearted) it shows a sense of pride in her new shape and her fearless attitude to styling. Winner alright! So ladies if you are looking to dress your bump you can still look in your favourite stores but not in your usual size or style. Maternity wear is not just restricted to maternity specific clothing (which also looks amazing) but requires a little more ingenuity. I feel that accessorizing along with a great hairstyle and makeup are one of the most important areas to focus on as we transition through this short term adjustment to our body-shape and one where we too can be unrivalled in the style stakes. For information on general personal styling, occasion wear styling and pregnancy styling advice email Fiona@fhstyle.ie or log on to www.fhstyle.ie for information. This entry was posted in Irish Fashion News on August 3, 2014 by Fiona Hayes.